Long time, no read, eh? 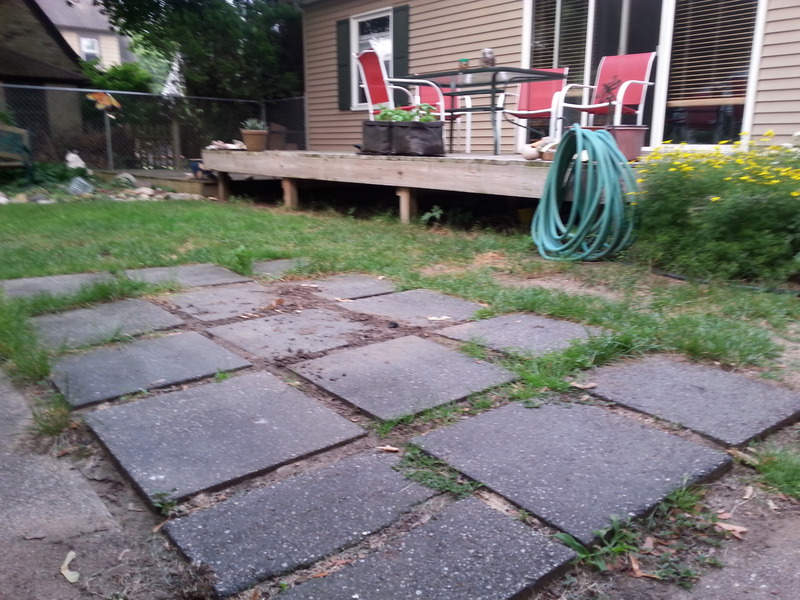 It’s been a long homespell for us this summer, as we tackled projects long neglected. Since returning from our last trip in early April, here’s the short list of what we’ve been up to. John’s folks moved into an independent-living apartment in December. 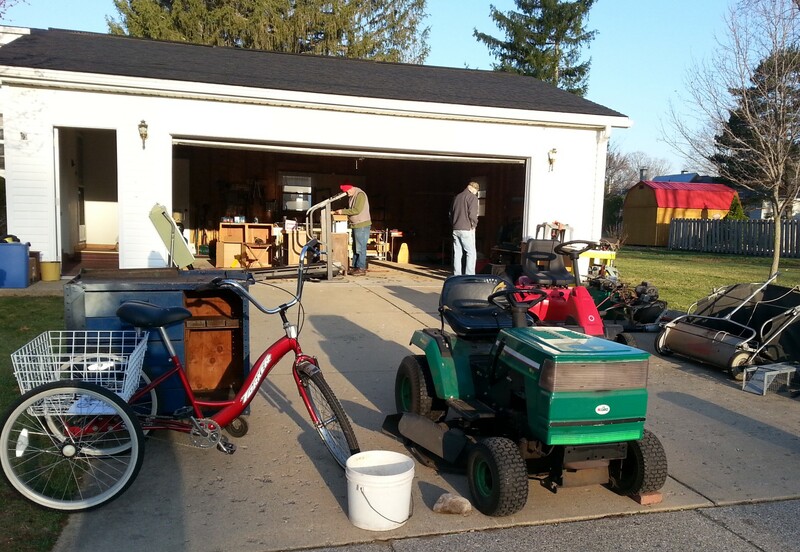 All the stuff they didn’t take with them was part of a massive estate sale in April. Then, we got everything cleaned and shined, and the house is now on the market. 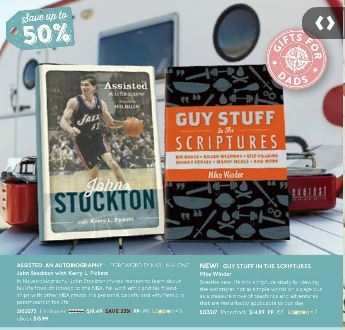 There’s an offer pending, and we’re hopeful that this time it will result in a sale. Frank and Verna Crankshaw (John’s folks) also celebrated 70 years of marriage this summer. Can you imagine? There’s always lots of bike-related stuff for us in the early summer months. 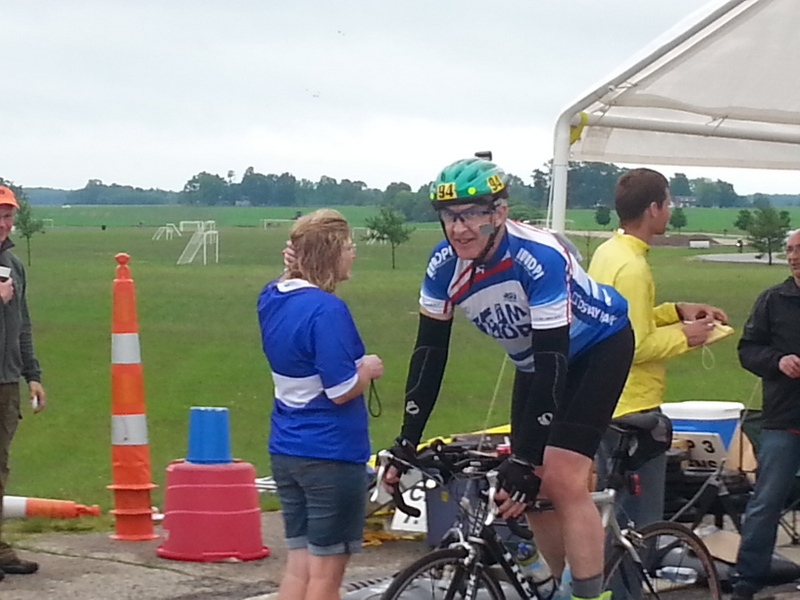 I’m a volunteer for the Rapid Wheelmen 100 Grand Bicycle Tour, and the MSU Grand Fondo. 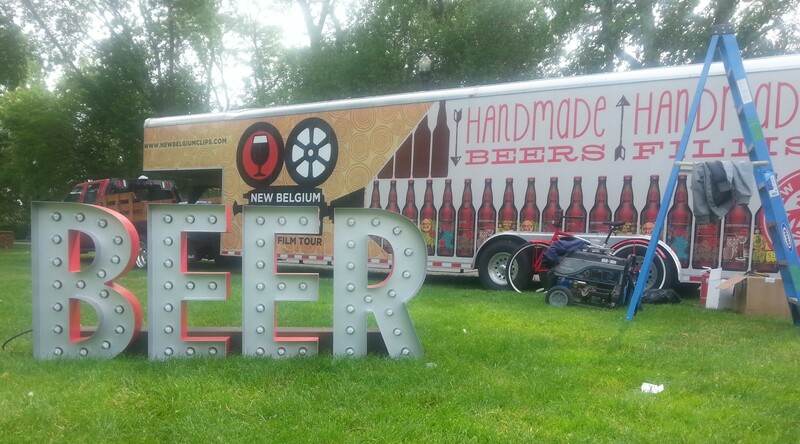 The New Belgium Clips Beer & Film Tour also comes to town in early summer. Love volunteering for these events, as I know what a PITA it can be to wrangle volunteers. 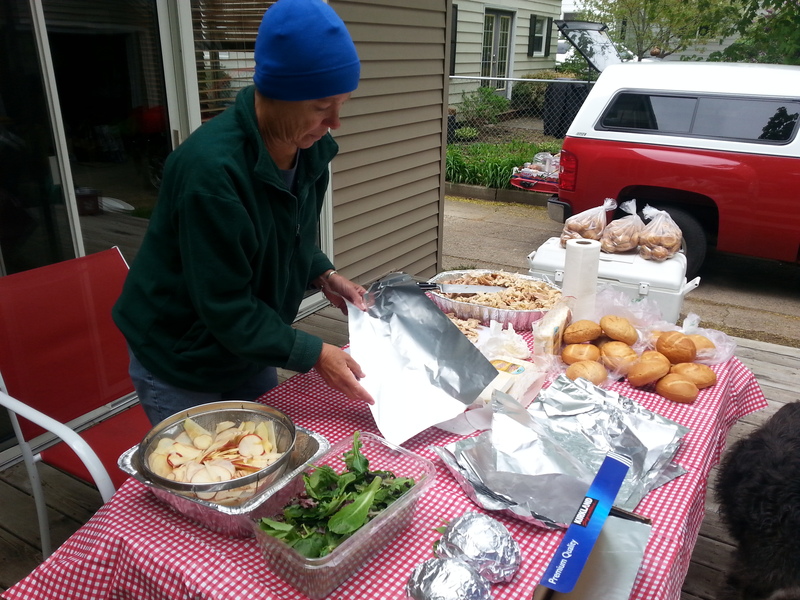 These events all give a big boost to our local cycling community, so it’s fun to give a bit. Cycling is a big part of our lives (John and I met in the Rapid Wheelmen Bicycle Club). John’s involved with the National 24 Hour Challenge, both on a Director level, and as crew chief for a variety of riders. This year, he crewed for the top female rider (423 miles) and also for the woman who set a new record in the 70-74 year age catetory (298 miles). Three or four of the other riders on his team set personal records. It was a huge year for him and his team. We finally got our back yard in shape by adding a new patio. 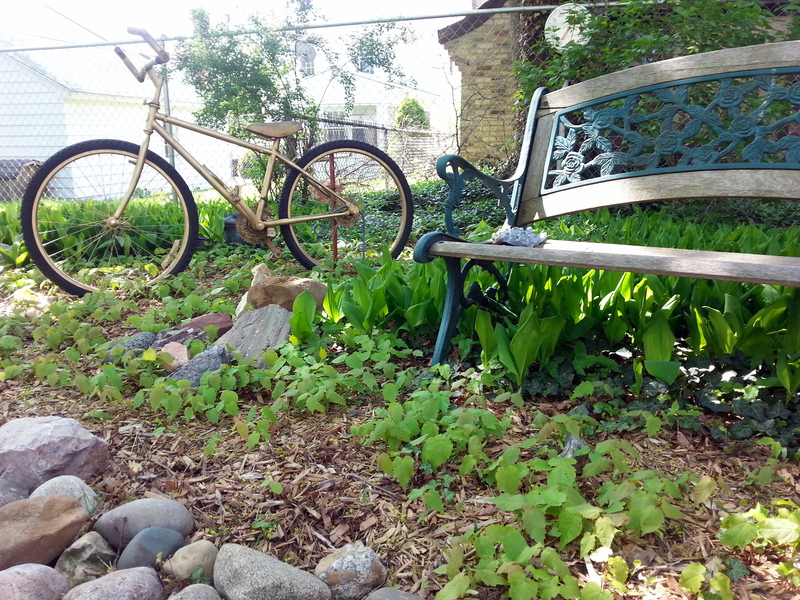 Old back yard….. Wow – what an improvement. 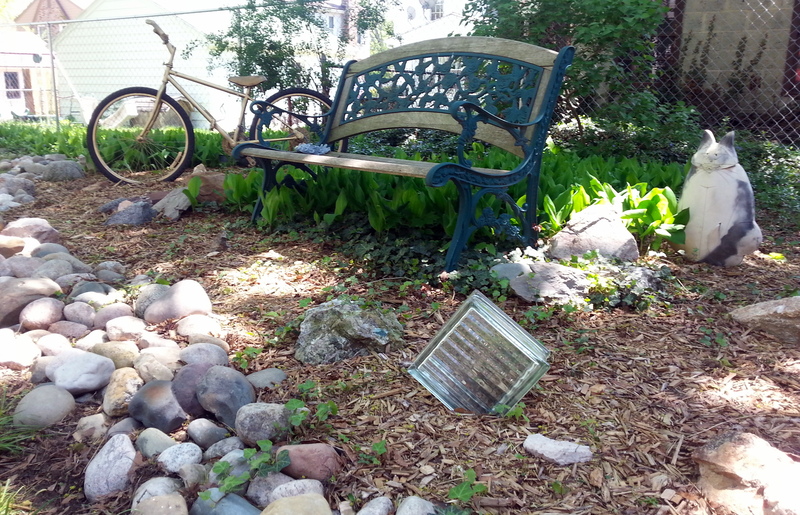 New back yard…. Of course, the completion also meant that he could finally get a Big Green Egg grill. 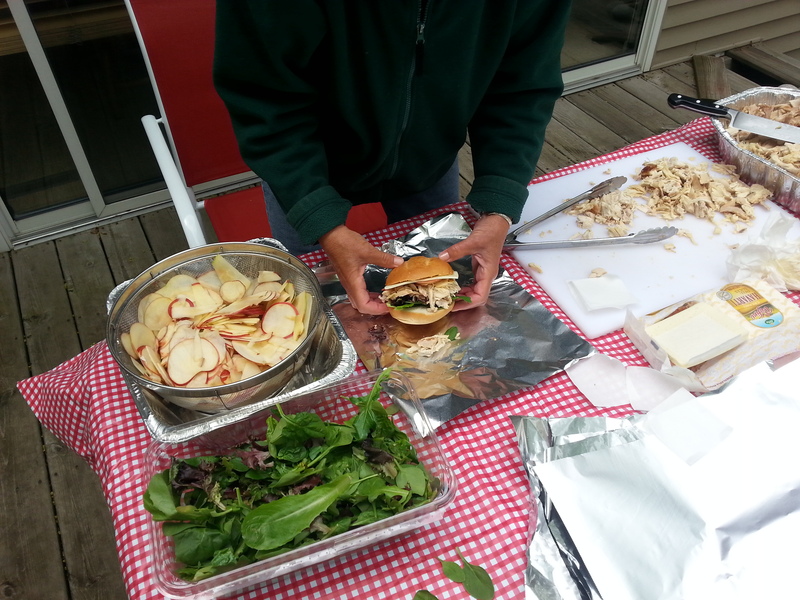 Wish we would have done this years ago – our backyard dinners have been fantastic! 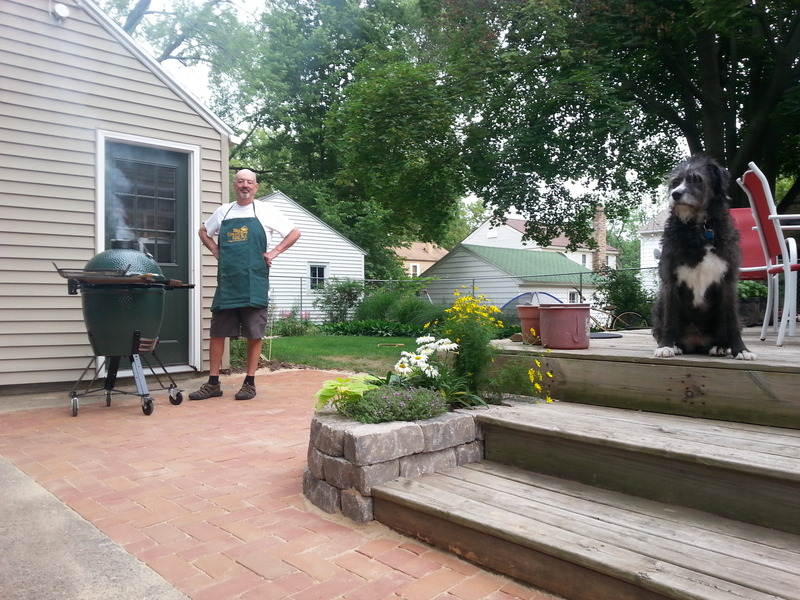 We loved our Weber charcoal grill, but John’s really at the top of his game with the Egg. Our clutter reduction program continues. Spent the worst two days of my life having a garage sale. Made a measly $200, but took about two truckloads of leftover stuff to Goodwill. Good riddance! The struggle to simplify took a big leap forward. 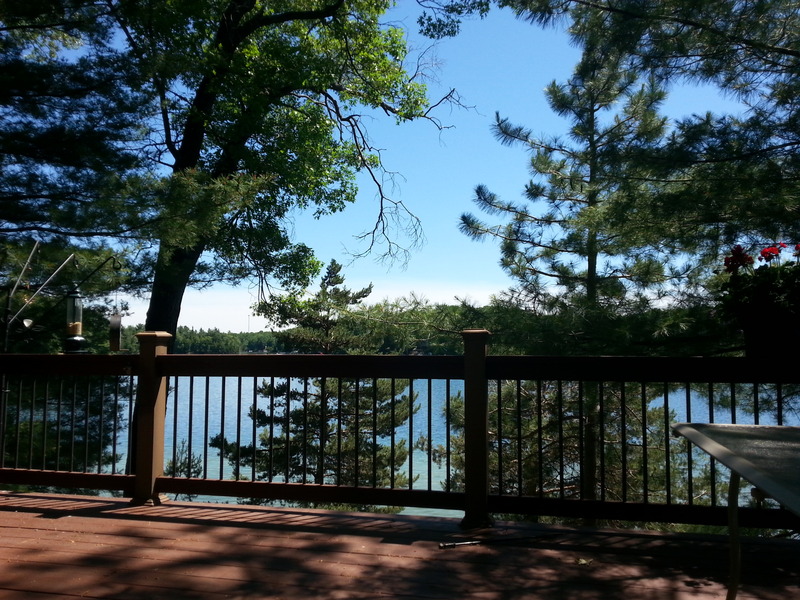 While John was camping/cycling with his guy friends, I had a girls’ weekend at a friend’s cottage. Visited an elk ranch! 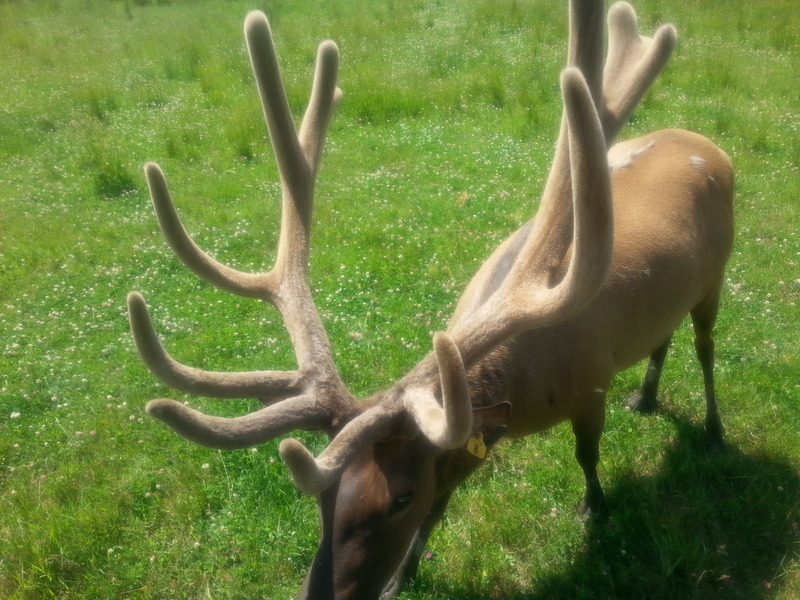 These enormous antlers grow within a period of just a few months. Impressive antlers like these begin to grow in late March, and this photo was taken in late June. These enormous bulls were docile enough to eat oats from our hands – but when the fuzzy coating begins to drop off the antlers and rutting season begins, it’s another story. The bulls become very aggressive, and playtime is over! But, finally…..the Fireball is ready to roll again tomorrow. We’re heading out for two weeks – first to driveway camp at a friend’s cottage for a few days, then on to our favorite campground at Nordhouse Dunes for 10 days.. The first weekend of the Nordhouse trip is tied in with the Night Shift – a wacky 100 mile nighttime road ride. We’re the support/chuckwagon for this motley group, and it’s a blast. 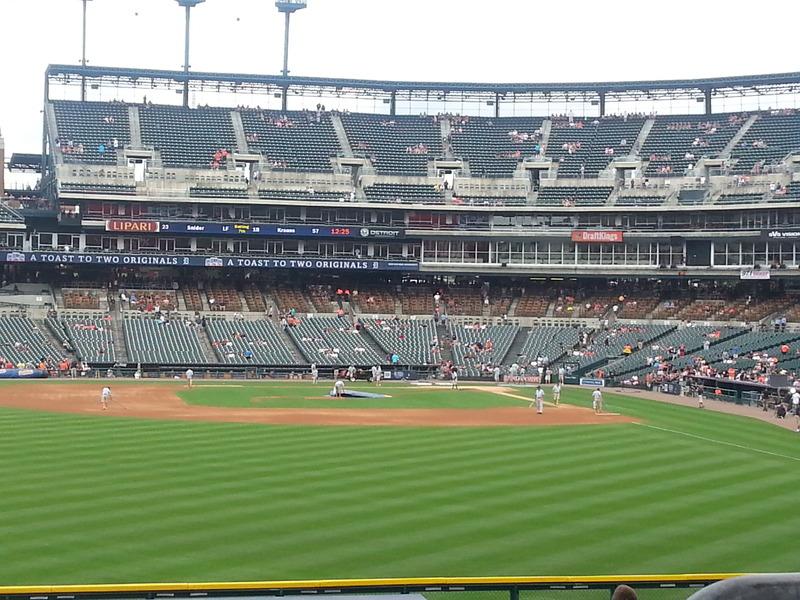 After that, we’ll be home for a few days, then off to Brighton Recreation Area (on the east side of the state), camping, taking in another Tigers game, and visiting some long-lost relatives. Both John and I have a bad Camping Jones right now – time to roll! Hopefully, at the end of the month, roofers will finally come to put a new lid on Chez Crankshaw. Ice buildup/backup for the last couple of years has damaged some of our interior walls, and we’re hoping that new roof + insulation will fix this. All this is prep for a two-month trip to the mid-Atlantic states in September/October. Can’t wait to visit Boston and Providence. We’re trying to decide if we’re brave enough to camp near NYC to take in the sights for a week. Our camp style is to hang outdoors and bike/hike. 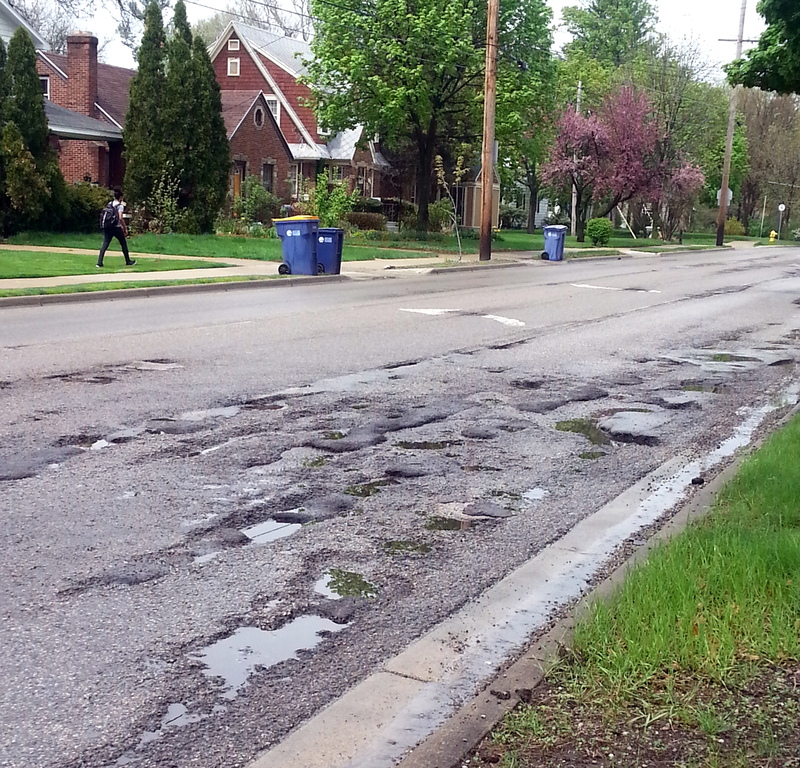 Not sure if we’ve got the grit to brave the big city, but there’s so much I want to see. We are still debating……stay tuned. I fear losing credibility with anyone following this blog. How can every campsite be the New Best Campsite, and each new stop be the Most Beautiful Park Ever? Can I even be objective about this anymore? 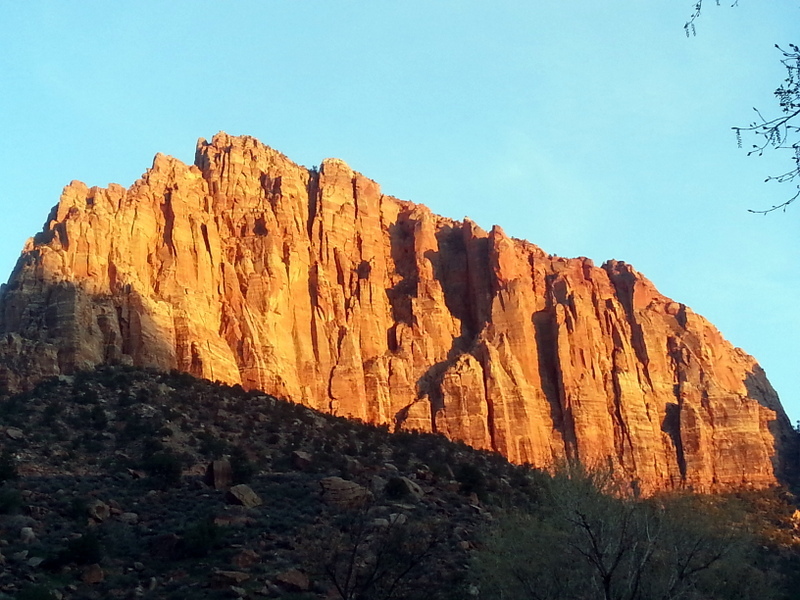 Instead of standing on the rim and viewing the Canyon floor, we’re now camped on the valley floor and gazing up at the Navaho sandstone walls towering overhead. Magnificent. We pulled in later than our usual ideal time, after dawdling around Grand Canyon soaking up the last of the sights there. So, it was around 6:30pm when we finally arrived to find a packed campground teeming with tents, RVs, and campers of all sorts. Been a long time since we’ve camped in such a busy spot, but it’s worked out well. 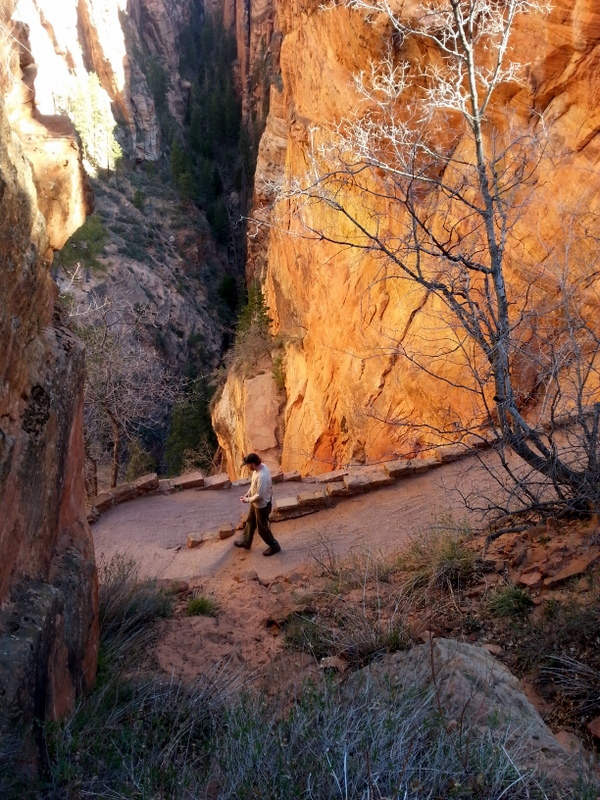 Our first disappointment came the next morning when we found that the shuttle buses which take hoardes of visitors up the scenic drive to major drop-off spots doesn’t begin operation until April 1. The congestion created by hundreds of cars on the narrow two-lane road is unbelievable, and haphazard parking creates all kinds of difficulties. So, we decide NOT to drive from the campground, but walk to a nearby hike with views of the Valley. One thing I really love about the National Park Service is their attempt to use native materials and incorporate native color schemes into the parks. 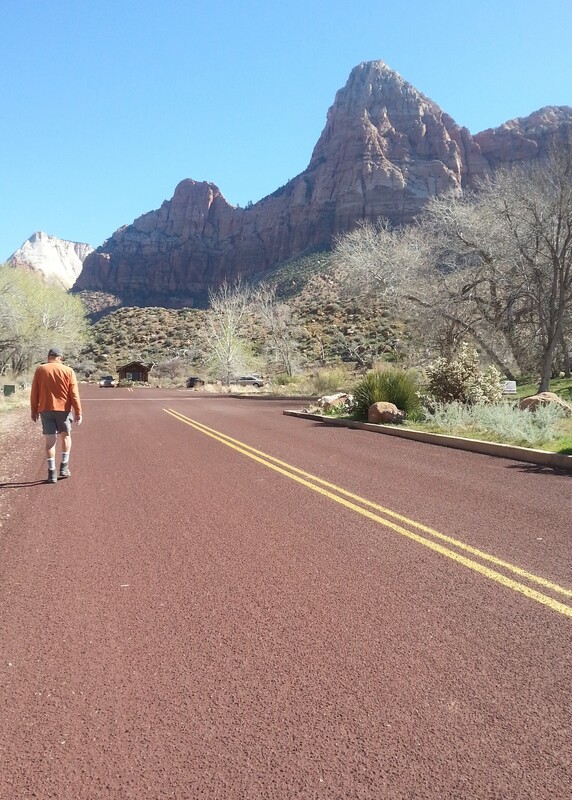 The result of this is the beautiful red scenic drive, which blends into the surrounding scenery. Small touches make huge differences. It’s Day 3 already, and we know that we have to get cracking to get our two dream hikes accomplished for this trip. 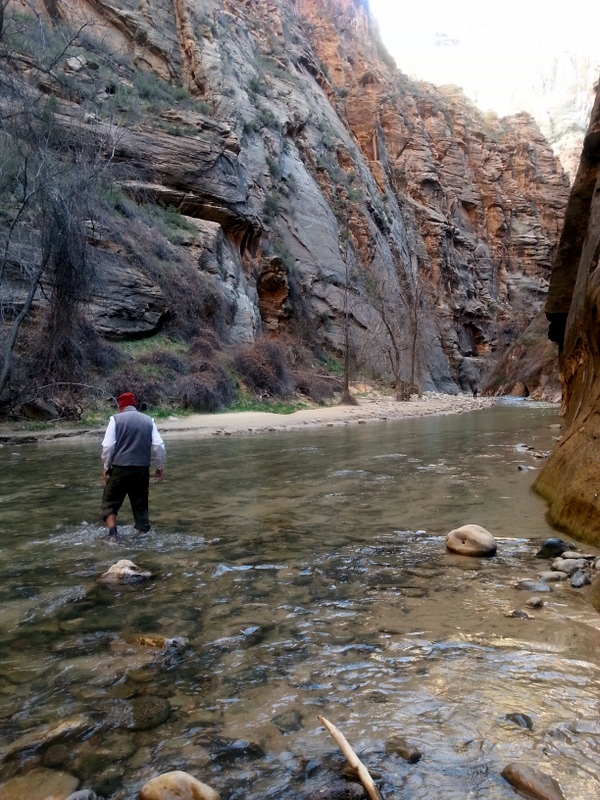 The biggie for us to hike into the Narrows, a slot canyon at the north end of the scenic drive. 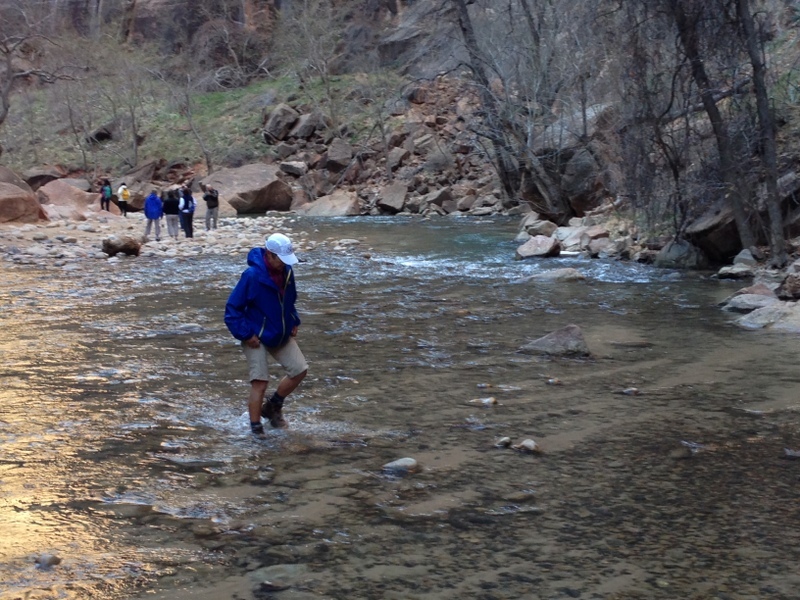 The Virgin River runs through the canyon, and we know that this will mean getting our feet wet. We have waterproof hiking boots, and are willing (fools!) to wade in and and take our chances. Such dopes. We pack our lunch, load our backpacks and head off in anticipation of stepping daintily across river stones, gazing up at the ever-narrowing canyon walls. Not exactly. We meet folks in the parking lot wearing wet suits and dry suits, carrying special wooden poles to find their way across the river bottom. 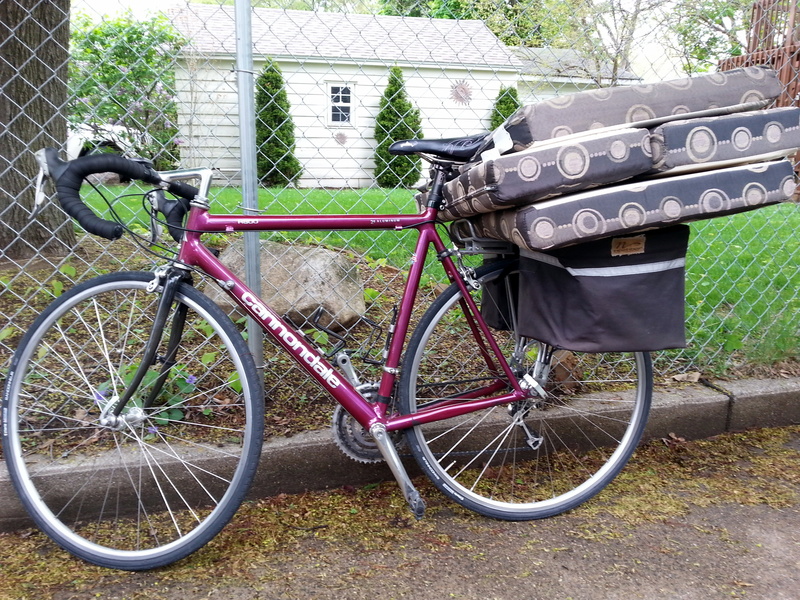 Seems like this specialized gear can be rented from outfitters in town for about $50 per day. So, we stroll out along a milelong path, until we get to the beachy end of the Trail. Lots of folks are standing around taking photos. We watch two older guys (in wet suits) march off into the water, carefully picking their way across the river to a wide sandbar on the opposite shore, about 25 yards away. “Hell, I’m going in”, announces John. With that, he rolls up his pants and steps in. I follow. 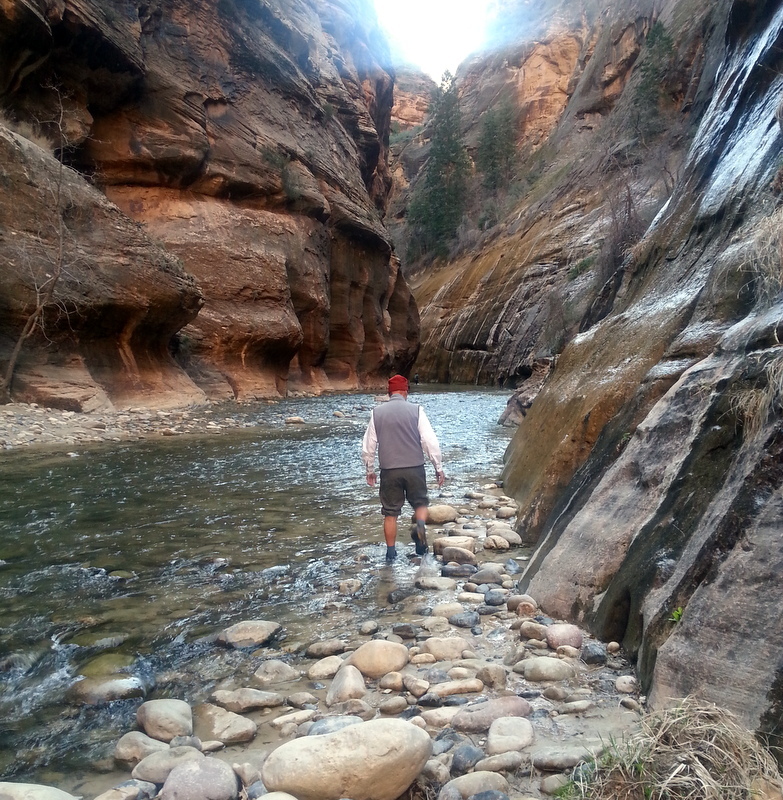 Picking my way across, all is well until the first rush of freezing cold water rolls over the top of my boot. Yowza! It’s March, and the water temp must be around 40 (air temp around 45). Well, once it’s done, we just march on to the relative safety of the sandbar. We wander along, boots pumping out water with every step. End of sandbar – we have to wade across the river again to the shallows on the other side. We slosh back in. Splashing along until we come to young couple contemplating their next move. They’re watching the folks about 100 yards ahead of them who are wading in water up to their thighs! The folly of our plan is becoming pretty clear. 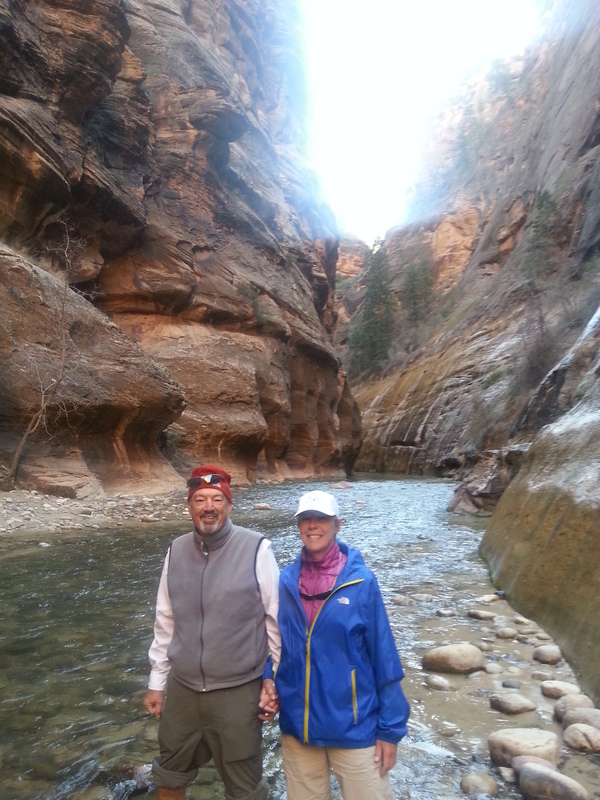 Our fellow travelers take our photo, standing in freezing water up to our calves, and we make our way back. As we head back toward the truck, we spy an interesting spot across the river with an old staircase rising above the rocks. We plunge back into the river to check it out. On the other shore, we find a water source and old rock climbing lines set in the wall. We bask in the sun for a bit, then have to wade back through a very strong current. 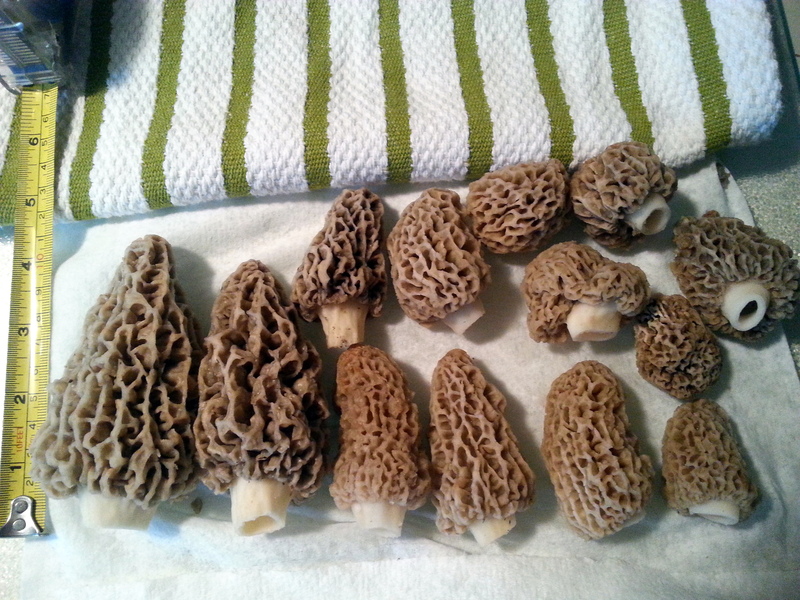 It was a great morning. 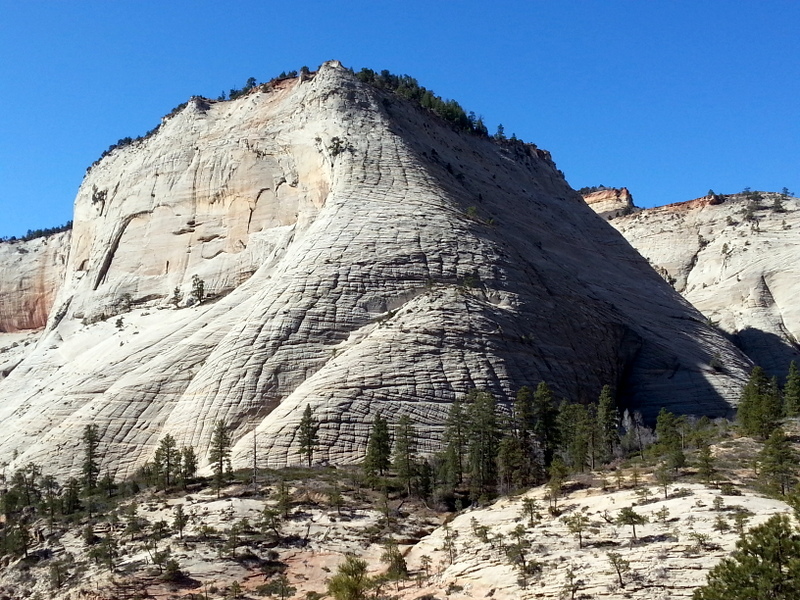 To escape some of the growing crowds, we decide to spend the afternoon on the east side of the Park, scrambling around the red and white limestone slickrock there. We found a great spot for lunch. 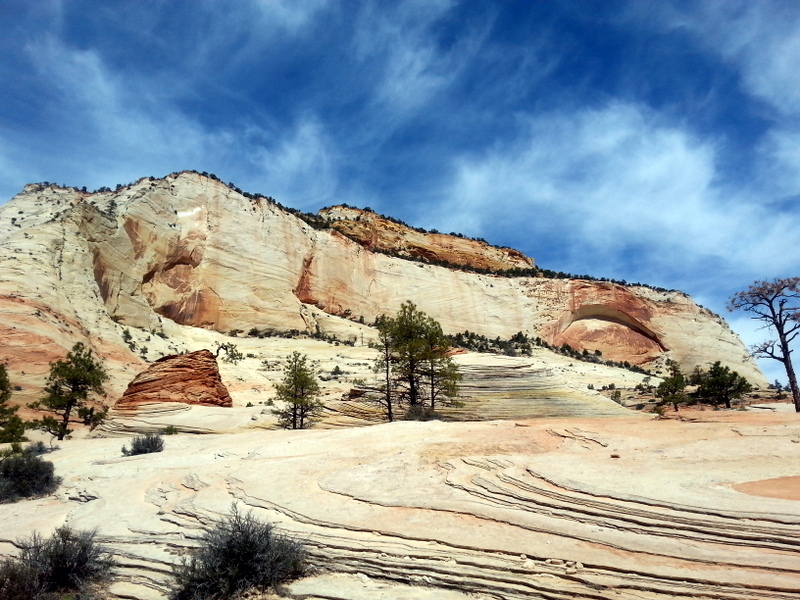 Got a good look at the formation called the Checkerboard Mesa, a white limestone cliff with wind erosion in a unique pattern. 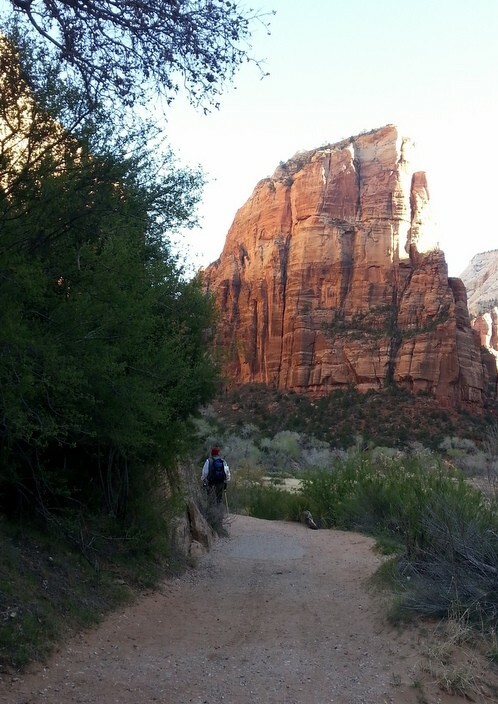 One last stop for the day was the Canyon Overlook Trail, a 2-mile roundtrip hike with spectacular canyon views. 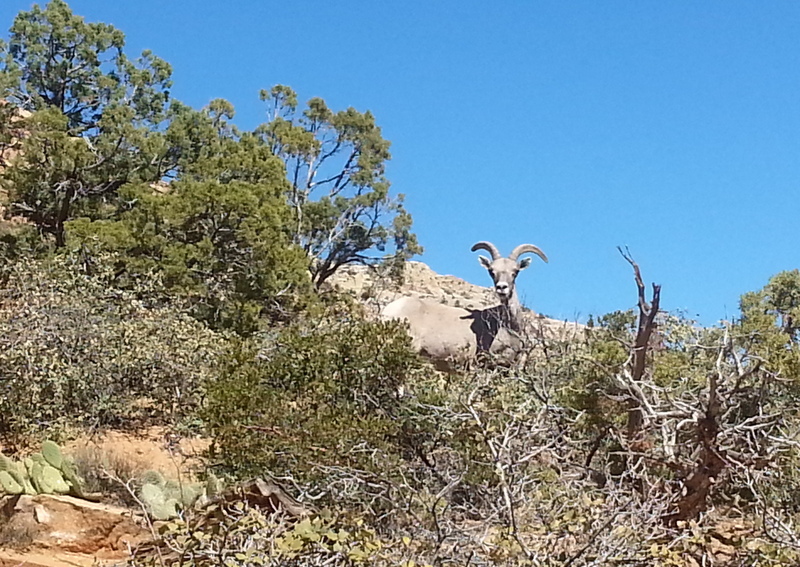 Best of all were the five bighorn sheep perched on a rock just above the trail. Once again, we were lucky to be in the right place at the right time. Day 4 – our last day here. 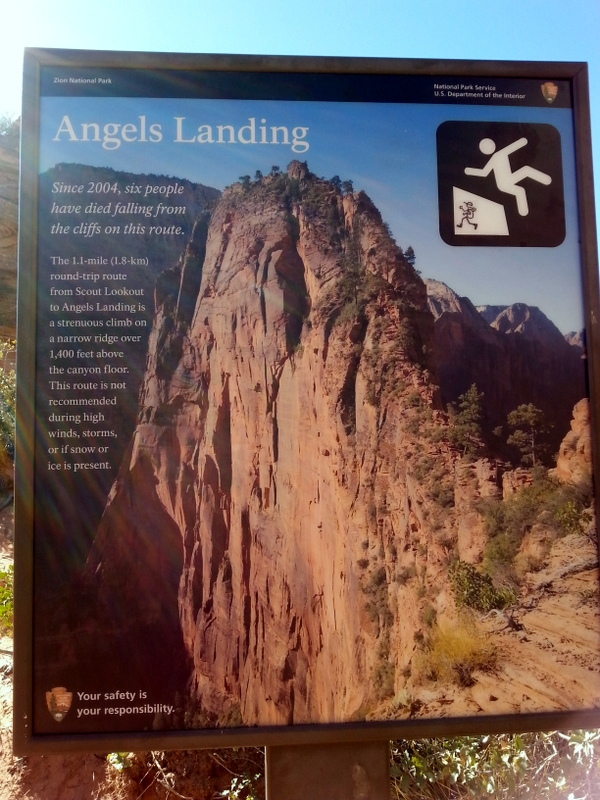 The hike has to be Angel’s Landing, a strenuous 5 mile round-trip trail, with a series of switchbacks knows as Walter’s Wiggles. 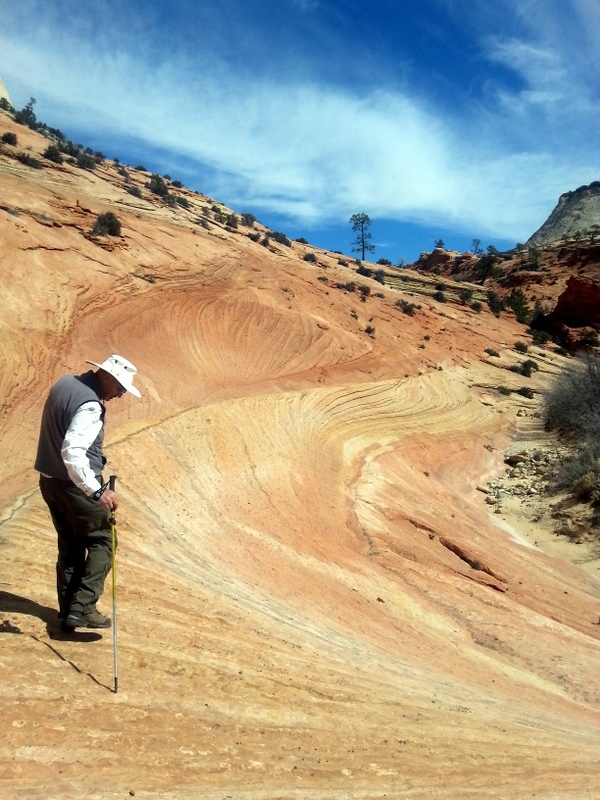 On top of this is a sandy spot known as Scout’s Landing, the last point before a very treacherous ascent to the top. 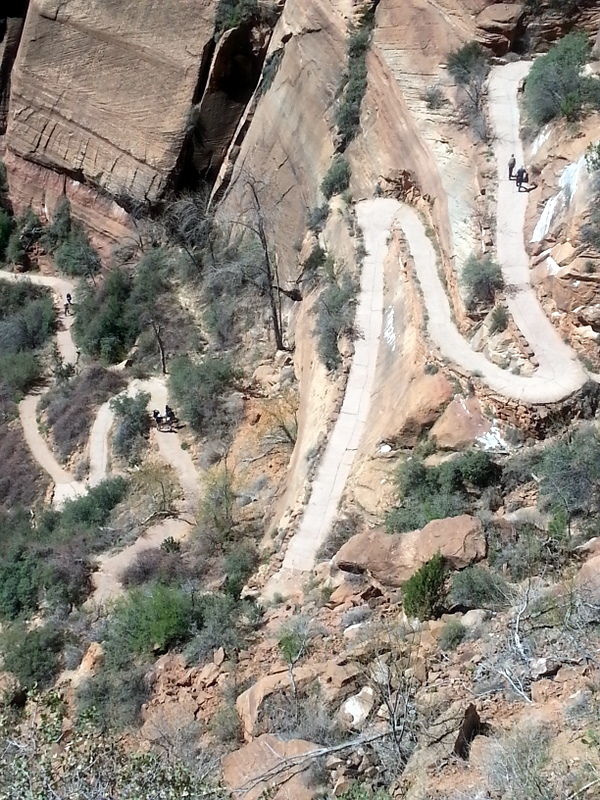 Getting to the top requires pulling yourself along a series of chains planted in the slickrock. 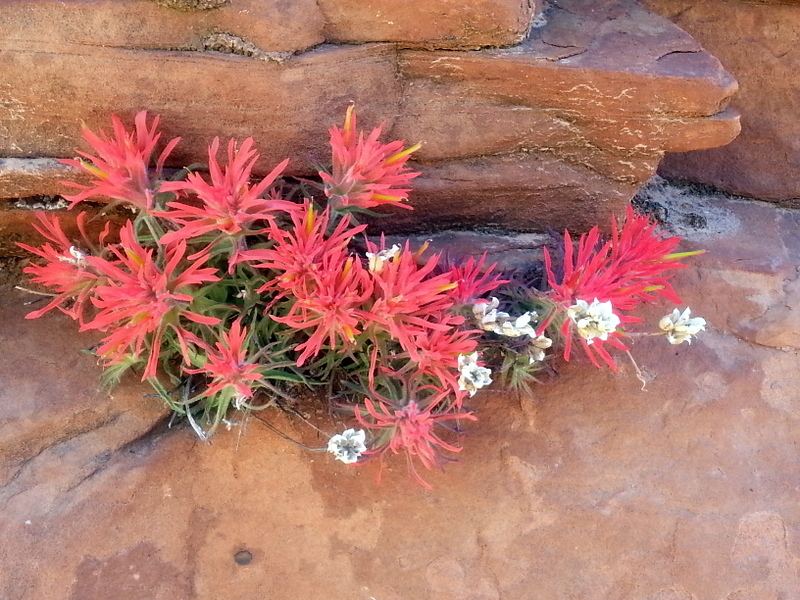 Footholds are very narrow, and the dropoff to the canyon floor 1400 feet below is unprotected. Having gotten an early start on the day, we were at Scout’s Landing before the big crowds of the day. Leaving our packs behind, we gamely set off on the steep sides, doing pretty well. 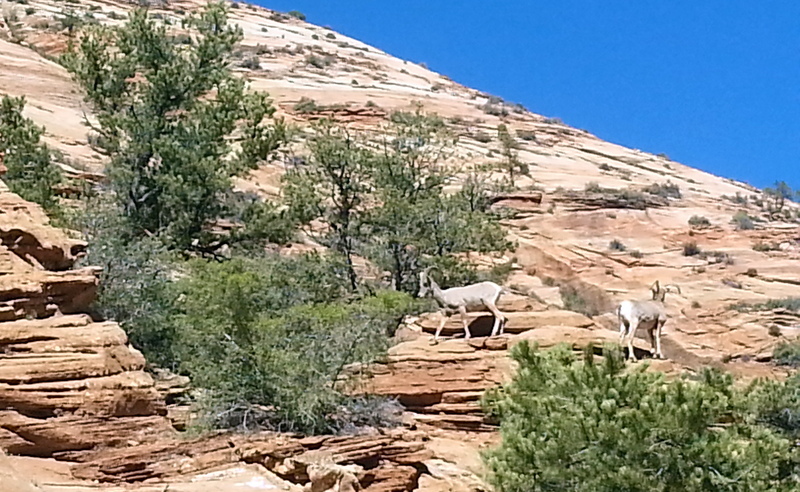 But, when we hit the first plateau, about 300 yards up, we decided to call it quits. 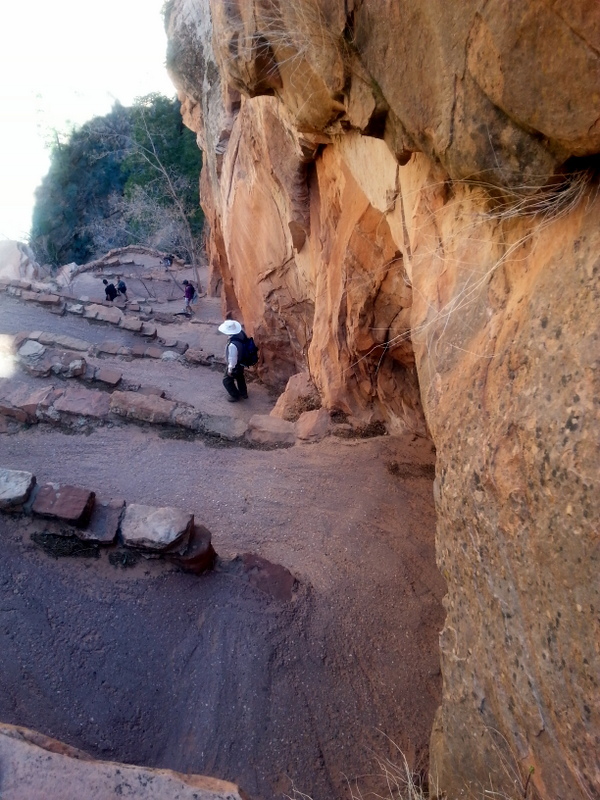 The next series of chains were very, very steep, and the footholds tiny. We admired the views from our precarious perch, and headed back down. (we stopped at the big tree in the center of the photo). The return trip was twice as harrowing as the ascent, reinforcing our decision to bail out as the smart one for us. 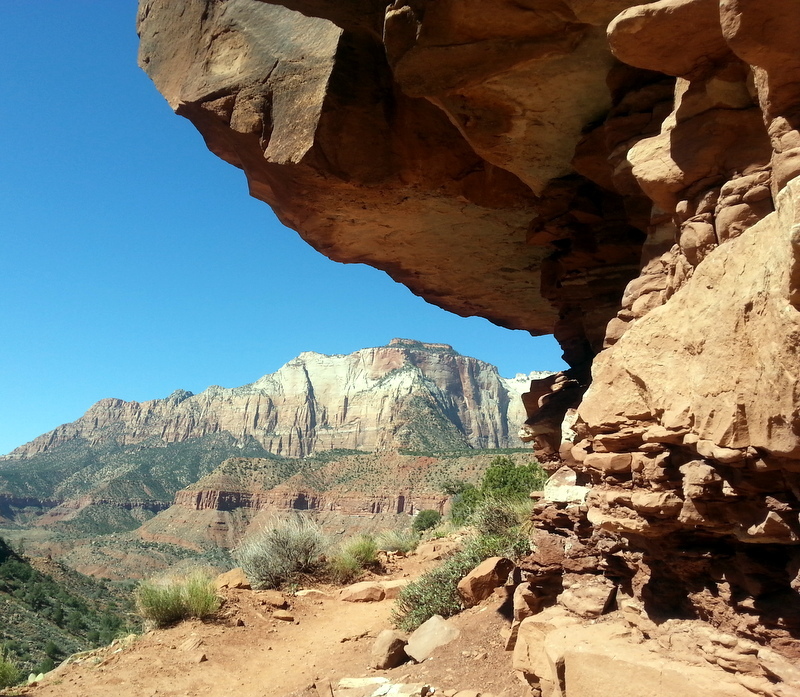 From Scout’s Landing, we prowled the West Rim Trail for a mile or so, looking for a good lunch spot, protected from the wind. 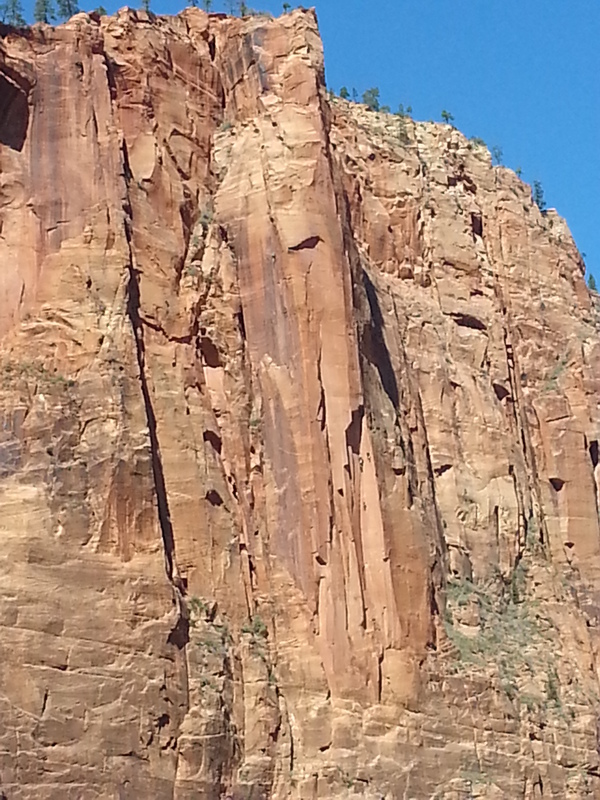 At one point, we laid on our bellies and peered over the rim of the canyon to see a couple of rock climbers below. We ended our hike with big smiles. 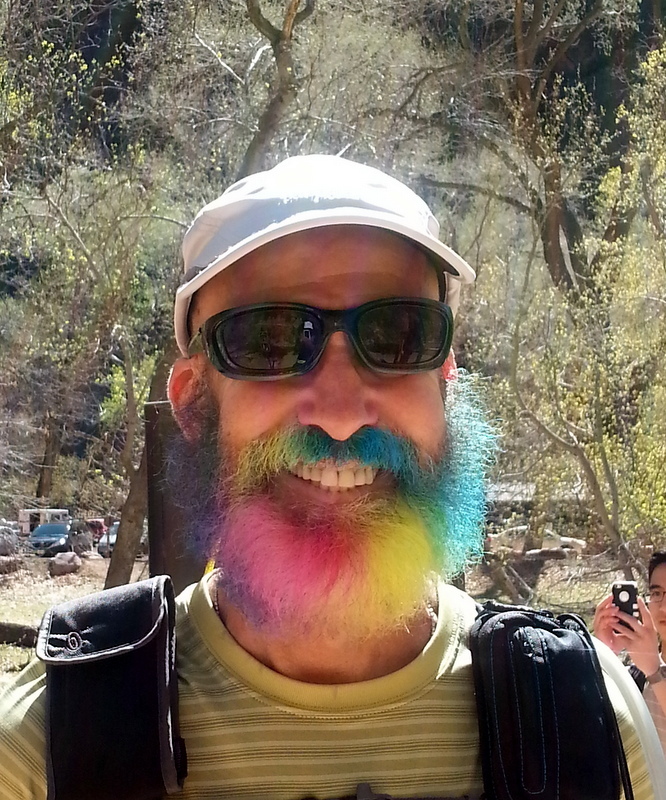 One more unusual event punctuated our day. 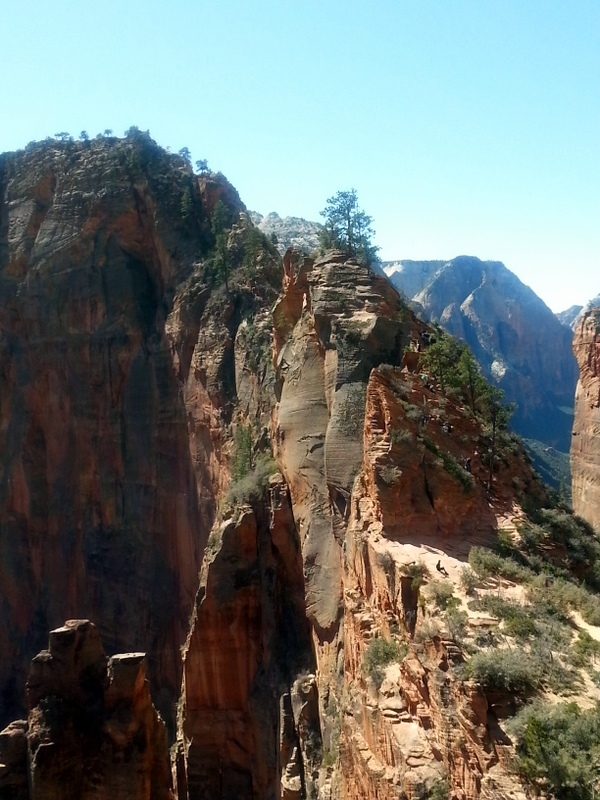 The previous day, we had noticed a big satellite truck parked not far from Angel’s Landing. John surmised that the truck might somehow be related to the rock climbers we saw, so we decided to investigate. Bingo! The truck was sending a live feed for a BBC reality show, To raise funds for families with hardships, including typhoon victims, show host Alex Jones is climbing Moonlight Buttress, a sheer 1200 face. (You can see the crew in the lower right side of the photo) The trick is that Alex has only climbed once in her life, and before January, had never climbed at all. With a professional trainer, and three cameramen filming every move, she’s climbing this massive wall. We went back in the evening to check progress – looks like she’ll make her summit on time sometime Friday afternoon. There’s lots of info on the web on this crazy stunt. 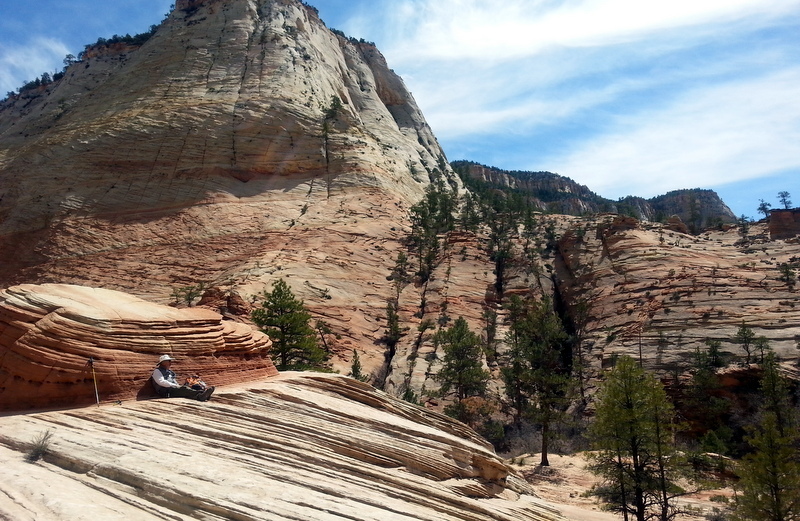 So, Zion’s been great, incredible. The best? Can’t imagine what’s around the corner. 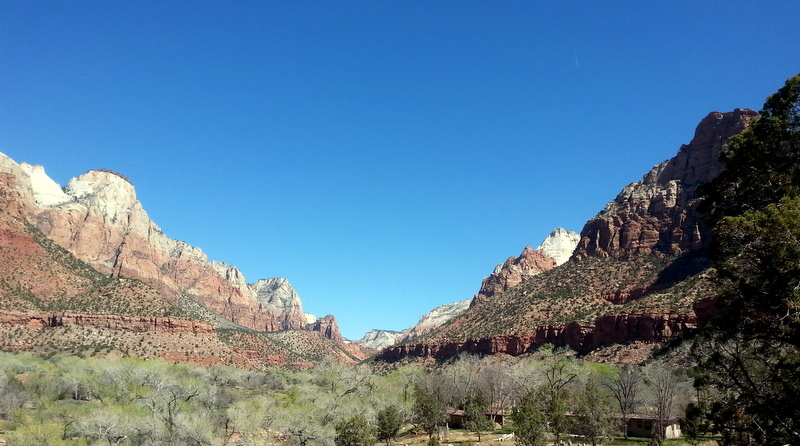 A few more random photos – we’re off to Salt Lake City for a few days of urban adventure. We’re headed to Salt Lake City for a bit of urban adventure for a few days. 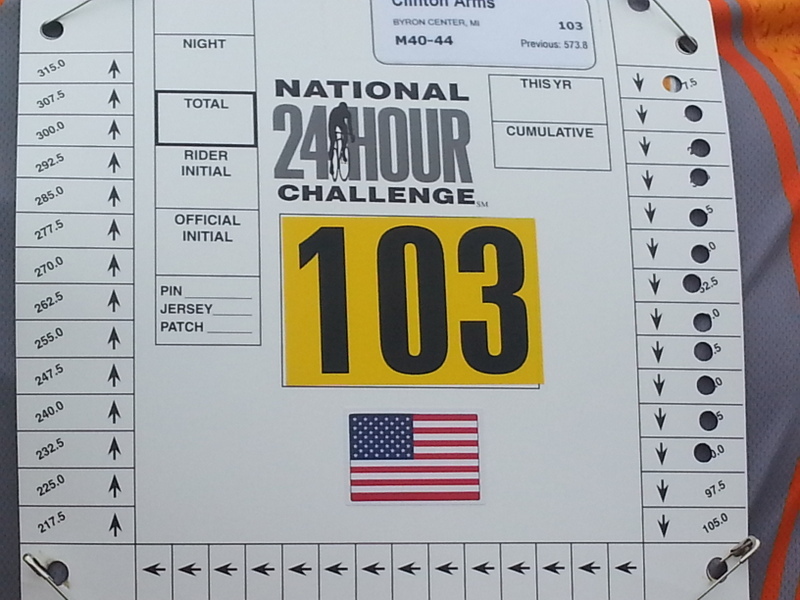 The National 24 Hour Challenge. 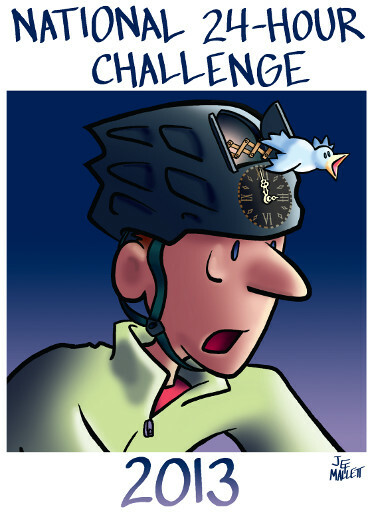 Sounds so simple – how far can you ride a bicycle in 24 consecutive hours? How will you deal with the pain, fatigue, nausea, cramps, bonks, and (sometimes) hallucinations that come with total exhaustion. Can you outride and outlast 400 other riders to become the overall mileage champion? The event is laid out in three loops. Riders must complete the first and second loops (117 and 25) by specific times in order to continue riding through the night on a 7.5 mile course. 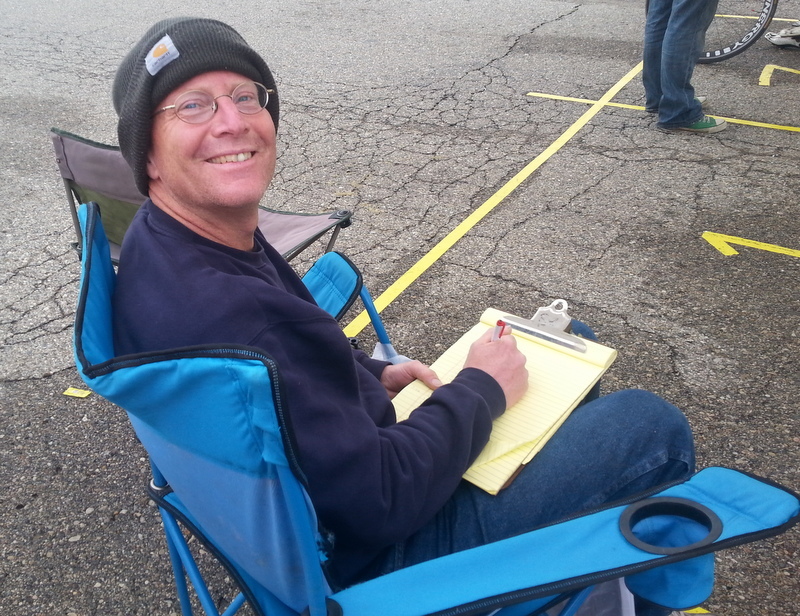 For several years, John has provided crew support for a number of riders. This year, nine riders took John up on his offer of assistance – many seasoned veterans of the N24HC, one newbie, and three riders making their second attempt. The weather gods once again wreaked havoc with the N24HC. Fierce thunderstorms passed through the area in the wee hours, forcing a nearly three-hour break. The unwanted rest benefited some riders, and hurt others. After hours in the saddle, body parts stiffen up after an extended rest. Although a rest or nap sounds like a really great idea, it can hurt more than help. At 4:30am, the storm finally passed, and the ride resumed (finish time is 8am, Sunday morning). Probably less than 1/3 the original 300+ riders were still on their bikes at that point. Checkpoint volunteer Rick works from midnight to 8am. Two of John’s riders stopped their rides, but seven gamely continued unil 8am. Dawn peeks through around 5am, and spirits pick up. The final checkpoint/finish line is crowded with crew and riders, shouting encouragement to cyclists coming in. Lots of cheering. 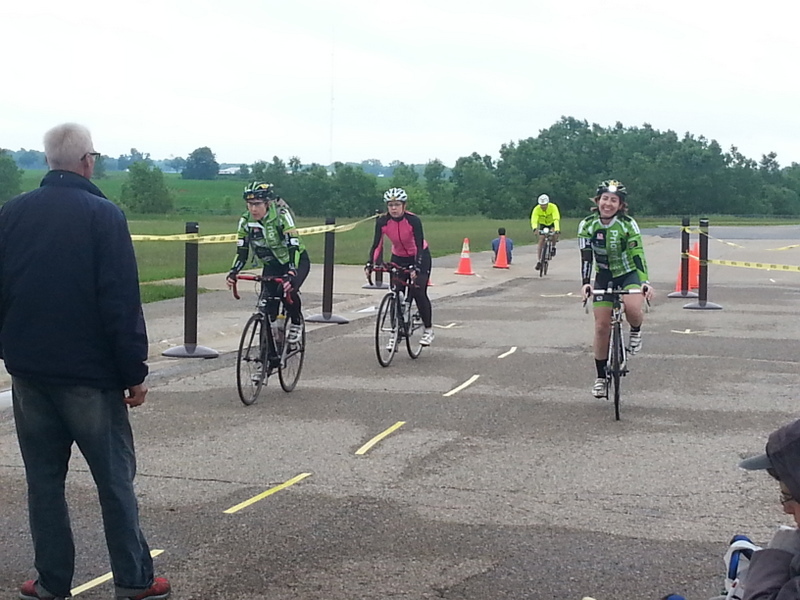 With a half-hour left to go, many riders buzz through the checkpoint for one last 7.5 mile lap. Pascale cruises into the checkpoint with one lap to go. Our eight riders are still out there. 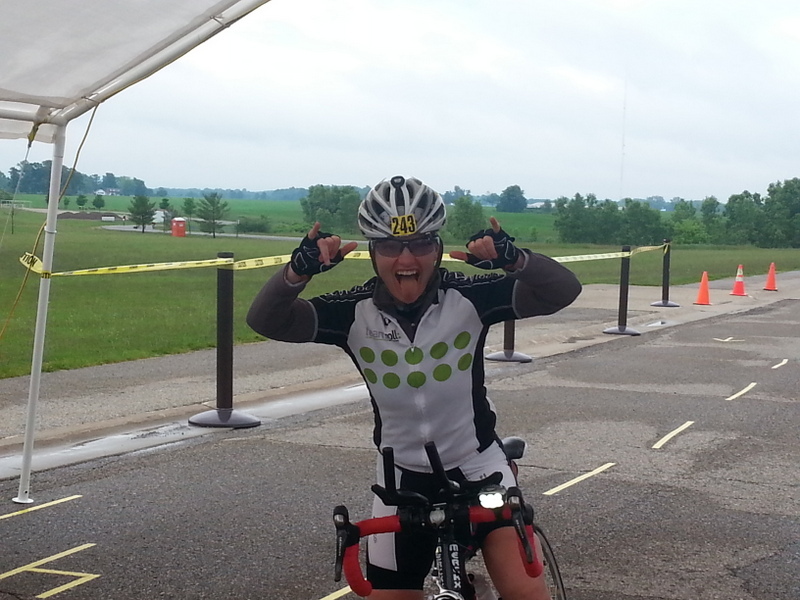 It’s crazy at the finish line – there are big smiles, a few tears, and the kind of wacky hilarity that total exhaustion brings (from riders and crews, alike). Camera are flashing, there are hugs, cheers, and cowbells. John’s team rode an incredible 2475 miles. Susanne 255, Denny 317, George 279, Clint 279, Pascale 339 (the overall women’s champion), Frank 232, Jason 232, Bill 256, and Gary 286. I’ve only pedaled the N24HC once – managed 220 miles, then quit. Wish that I had had the benefit of a crew like John to keep me going. Maybe I’ll try again sometime. I get really geared up while I’m there, but the reality of actually trying to ride 250+ miles gets the better of me each year. So, I help out. It tickles me to know that these super-riders are all “normal” cyclists who I’ll ride with on another day. 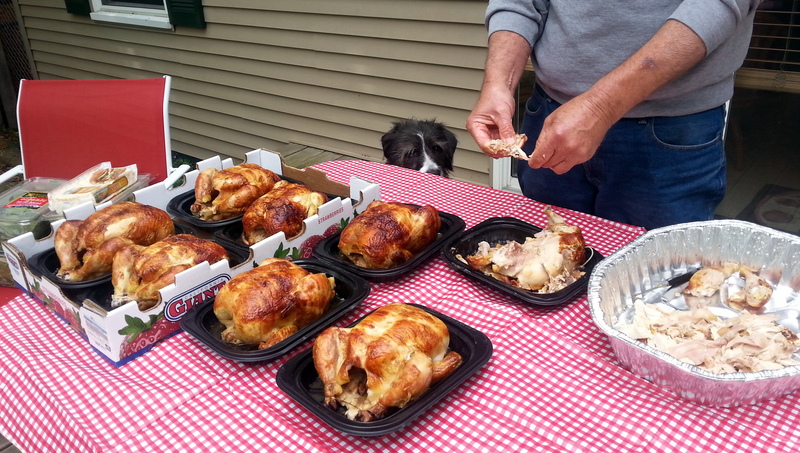 In the meantime, many are already plotting how to eke out more miles next year. John’s wondering how he might run his crew service a bit better. I’m wondering if Susanne really might tow me around for 24 hours…;-). We’ll see. 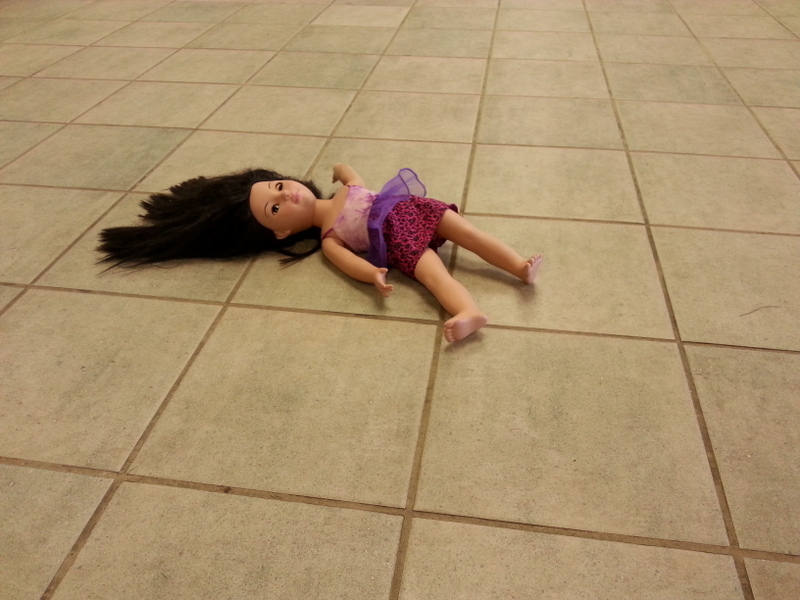 Pascale is dreaming of 400. Laura (2nd place overall woman rider) is plotting how to get 400 herself. Riders get a punch each time they ride thru the checkpoint. 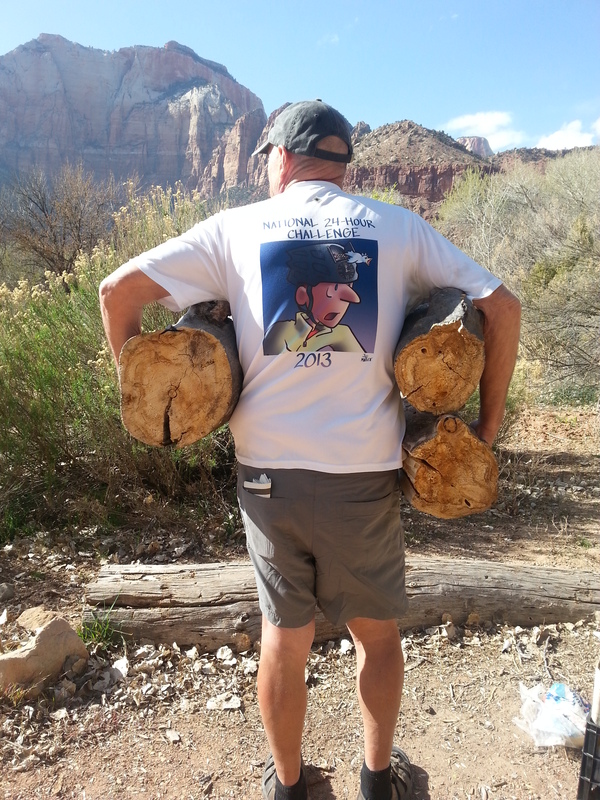 Until then, rest, my friends…..you don’t have to train for a few days. I felt like this, and didn’t even ride! Early morning fatigue. Bill looks like he could still ride more laps. Gene the Machine had 324 miles. Susanne gets a bit of wardrobe assistance. 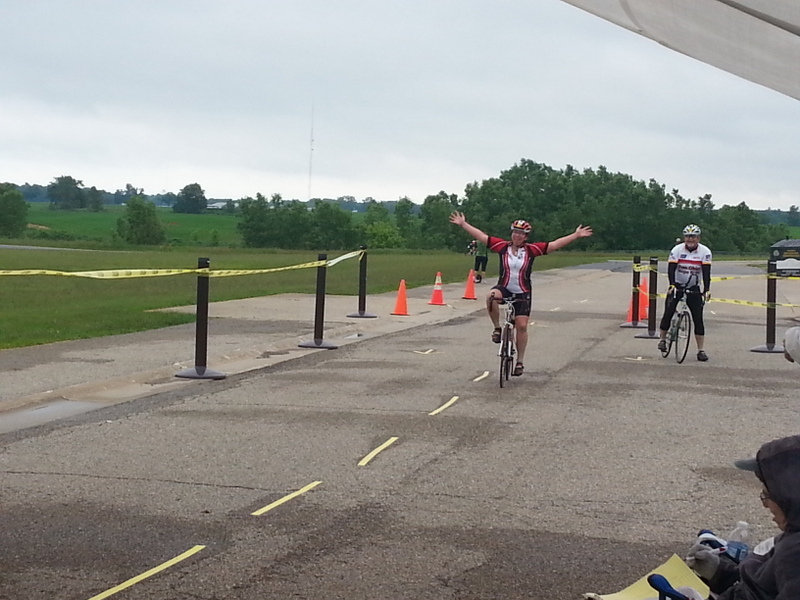 John and Barb beat out all of the other M/F tandem teams with 316 miles.